But a century before Erastothenes, Aristotle's book On the heavens (Περὶ οὐρανοῦ) gave five reasons to believe the earth is round. And one of them is a proof by elephants. What do you find if you go as far west from Greece as you can, to Africa? Elephants! What do you find if you go as far east as you can, to India? Elephants! 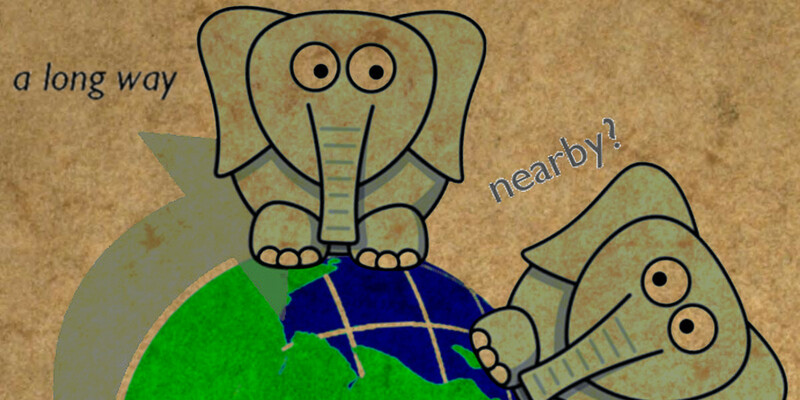 So obviously if the east and the west both have elephants, it stands to reason that they're next to one another. "Hence one should not be too sure of the incredibility of the view of those who conceive that there is continuity between the parts about the pillars of Hercules and the parts about India, and that in this way the ocean is one. As further evidence in favour of this they quote the case of elephants, a species occurring in each of these extreme regions, suggesting that the common characteristic of these extremes is explained by their continuity." ...they make a conjecture as to the similarity of both places from the elephants which arise in both places but are not found in the regions between them. This of course is a sign of the agreement of these places but not necessarily of their nearness to one another.